February marks a month to celebrate the vital role of African-Americans in our nation's history. Today, we will take some time to recognize an incredible individual who left a tremendous legacy in the world of microbiology, saving countless lives in the process. Please join us as we remember Dr. William A. Hinton, researcher, physician, mentor, and leader. Born in 1883, William was the son of emancipated slaves who settled in Chicago, IL. His academic talents were noted at an early age, when he became the youngest graduate in the history of his high school. He completed the premedical program at Kansas University (again, ahead of schedule) and then earned his B.S. degree from Harvard University in 1905. In order to have funds to continue his education, he worked at a law office and taught science, keeping up with his bacteriology studies during the summer at the University of Chicago. With his saved funds and the prestigious Wigglesworth scholarship, he completed his M.D. at Harvard (again, ahead of schedule) in 1912. CONSIDER THIS | The first degree of any kind awarded to an African-American at Harvard was in 1870. Three African-American medical students were dismissed in 1850 after white students protested their presence in lectures. Despite all his achievements, the freshly-minted Dr. Hinton was unable to secure an internship at a hospital - he was repeatedly denied due only to his race. With no opportunity to complete his credentials as a practicing physician, Dr. Hinton accepted a "voluntary assistant" position at the Pathological Laboratory at Massachusetts General Hospital. In just three years, he was running the lab as director and was a published expert in the diagnosis of syphilis. In 1915, he was appointed not only Director of the Laboratory Department of the Boston Dispensary, but also as Chief of the Wasserman Laboratory of the Massachusetts Department of Public Health, a position he held until his retirement in 1953. 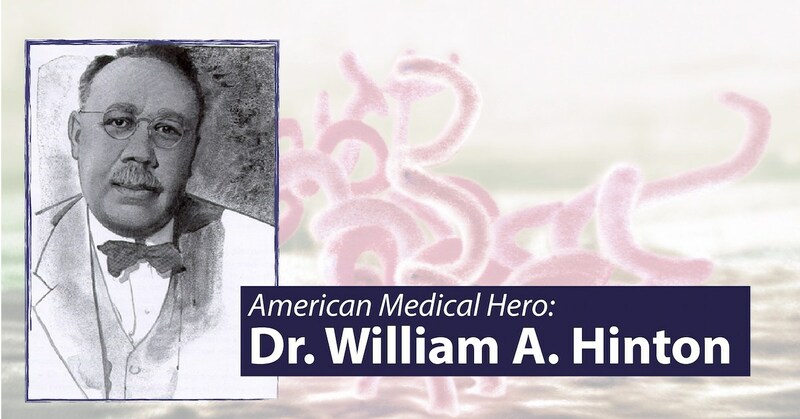 Dr. Hinton's contributions to the field of microbiology focus on the diagnosis and treatment of syphilis, a bacterial infection whose pathogen had only been determined in 1905. Syphilis, which gained the name "the great imitator" because its symptoms varied so much between patients and could often be mistaken for other diseases, could be treated. The progression of the disease, however, meant that early detection was critical to avoid permanent physical and neurological damage. Diagnosis was very difficult because, unlike most other infectious bacteria, Treponema pallidum could not be cultured in a lab. Until Hinton's test, technicians would attempt to find the bacteria through microscopic examination of fluid samples, resulting in highly unreliable results. Through meticulous investigation, Hinton discovered a way to inject fuid samples into a serum that, in the presence of T. pallidum, would flocculate, or form flakes, resulting in a highly reliable diagnosis. In the words of a 1929 analysis, the test was "simple to perform, and, what is even more important, easy to read." By improving the accuracy of diagnosis with what became known as the Hinton test, he equipped doctors with a tool to detect the disease while it was still in early stages and begin treatment immediately. He compiled his research into a textbook in 1936, the first medical textbook authored by an African-American. Dr. Hinton's legacy extends far beyond his life-saving discoveries. Under his tenure at the Wasserman Laboratory, he was able to expand the state's approved laboratories 10-fold, enabling far more blood and tissue samples to be processed. In addition to his dual leadership positions, Dr. Hinton continued to teach, serving as an Instructor in preventive medicine and hygiene at Harvard Medical School. He was finally promoted to Lecturer in 1946, and on the eve of his retirement in 1949 he was named Clinical Professor of Bacteriology and Immunology, becoming the first African American professor at Harvard University. His teaching was not limited to Harvard, however. Hinton taught at Simmons College, Tufts Medical and Dental Schools, and started an all-women's school for laboratory technicians. The first of its kind, this school would go on to graduate technicians who were hired around the country, playing an enormous role in opening up this field for women. This particular success became a personal success as well - his daughter, Dr. Jane Hinton, would go on to co-develop the Mueller-Hinton agar still used today. Always known as a humble and private man, Dr. Hinton did not seek out public recognition or fame. Feeling pressure from the entrenched racism of the 20th century, Dr. Hinton sought to keep his origins private, even going so far as to decline a prestigious award from the NAACP. He was concerned that his race would prevent colleagues from accepting his pioneering work, thereby denying patients access to his life-saving discoveries. Despite his self-effacing approach to his work, Dr. Hinton's legacy will forever live on in the name of the diagnostic test he developed but also in the name of the laboratory he directed. For decades, the Wasserman Laboratory was informally known as the "Hinton Laboratory." In 1975, the Massachusetts legislature officially changed the name to the Dr. William A. Hinton Laboratory in recognition of his many contributions. We hope you enjoyed this brief overview of an incredible microbiologist, someone whose contributions would be notable even before appreciating the incredible obstacles he faced due to his race. For further reading about this great man and his contemporaries, please check out the following resources.